Renamerox for Mac is an application that renames, copies or moves your files and folders with a powerful engine, making your daily work flow easier. You no longer need to alter each file or folder by hand. Amazing rename, copy and move software for Mac! When you want to prepare files or folders for your website, blog, and backups, or when you need to organize or duplicate files, or when you make copies of your audio and image files for your iPod, iPad or iPhone, you spend valuable time copying and renaming each item by hand. 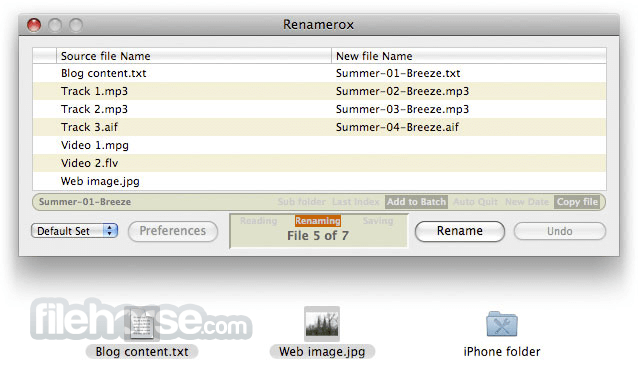 Use Renamerox for Mac to rename, copy and move hundreds or thousands of files and folders with a single drag-and-drop. 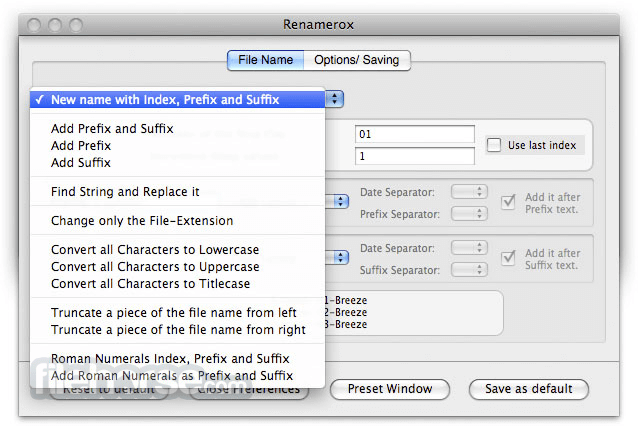 Renamerox supports drag-and-drop. An intelligent Drag-and-Drop engine makes the application easy to use. Drop as many files as you want or a folder that contains hundreds or thousands of files to the main window or to the application icon to rename, copy and move your files and folders. In order to have different settings for different jobs, use a preset for each job. set a new name with index, prefix and suffix. add a prefix and suffix. add a random digit as prefix. add a random digit as suffix. replace a piece of the name. set or to change the file-extension. convert the file name to small or cap letters. convert the file name to Titlecase. truncate some letters from left or right. create a new name with Roman Numerals index, prefix and suffix. add Roman Numerals as prefix and suffix. When you drop files or folders on the Renamerox application icon, Renamerox will start up and will immediately begin the job. If the checkbox "Quit after Job" is checked in the preferences, Renamerox will quit automatically after the job is finished. 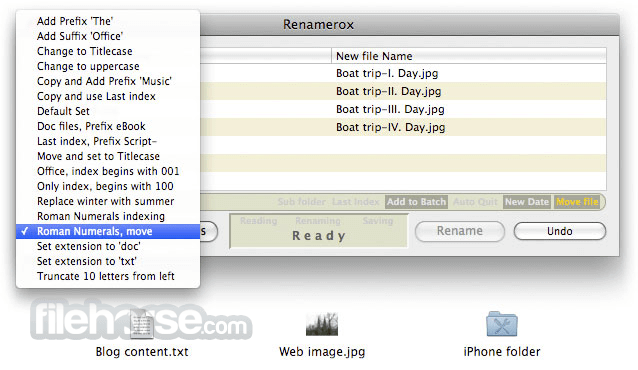 Renamerox for Mac offers several additional options to optimize the renaming process. Note: In the demo version two letters will be added to the item name. The purchased version would be without any limitations.